As China is the most populous country on the planet there is invariably going to be a huge array of dishes that you could use if you were planning a Chinese themed picnic. The secret to creating a good Chinese picnic menu, in my opinion, is to keep the ideas simple and most importantly obtainable. It is obviously highly desirable in many people’s eyes to be as authentic as possible when taking on a theme. And whilst I do agree with the sentiment, I also think that there is room for a few exceptions. Chinese cuisine is one of them. There is a reason that Chinese food has been bastardized in western society to such an extent that it is almost unrecognizable to our Asian counterparts. The cultures are vastly different. And what is accepted as palatable in one does not necessarily ring true in the other. Our meat almost exclusively will consist of chicken, beef, pork or duck. Whereas authentic Chinese meals may also include ingredients such as chicken feet, chicken fetus, snakes and shark fins. It is not only meat where our preferences can differ. We like to use a myriad of vegetables in our Asian cooking. Yet you will probably never see an authentic Chinese dish using ingredients such as broccoli or carrots. This is not to say everything we know and love from our favorite take-outs is a lie though. There are still dishes that we have grown up loving that can be classed as authentic Chinese cuisines. These include examples such as dumplings, dim sum, and wontons. Authentic or not, I believe our picnic basket does not need to strictly adhere to any rules when it comes to our Chinese shindig. And so it relieves a bit of pressure in terms of time, planning and preparation. As long as the intentions are correct and what you have packed tips perhaps more than a little nod to a Chinese themed day then even the most pedantic out there would be hard-pressed to criticize your efforts. So please read on for a few Chinese picnic ideas. Some will be instantly recognizable, some may be stretching the theme to its outermost limits and some will be bona fide traditional Chinese dishes. But all will be relatively simple to make, store and enjoy on your oriental day out. There’s something that is deeply comforting when you think of Asian soups. I think it’s the spice and heat that we associate with the continent so much which leads us to feel this way. We have already mentioned a couple of suggestions in our Thai Picnics article which we love and we hope you view the following classic Chinese themed soups we offer to you with equal enthusiasm. 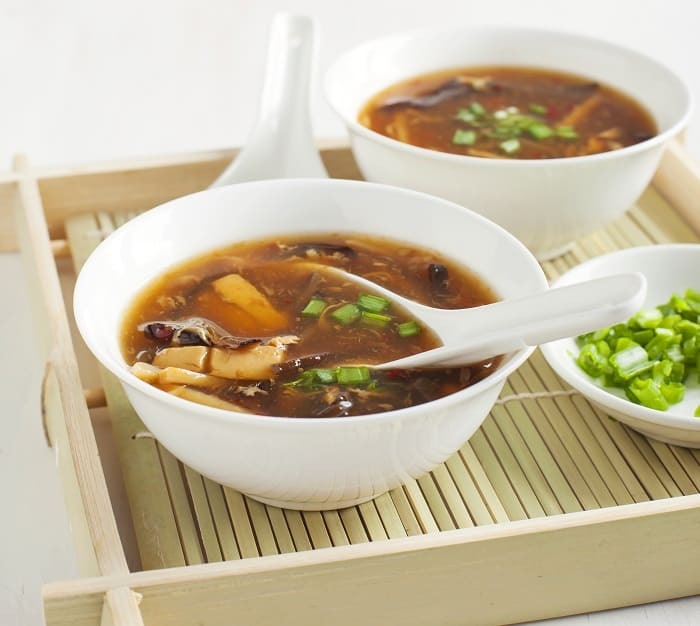 Hot and sour soup – The best soup in the world surely has to be on your Chinese picnic menu. Made from, amongst other things tofu, mushrooms, pork, and bamboo shoots, this awesome soup derives its heat from white pepper and its sourness from vinegar. If you have an Asian market near you I definitely recommend trying to make it from scratch, if not there is a handy cheat kit you can purchase that with your own tinkering can get you close to the real thing. Wonton soup – Another instantly recognizable soup and one that people constantly underrate. Wonton soup is beautiful if prepared correctly. The broth of the soup is light and flavorsome and the wontons can be made to your own personal taste but it would be remiss of me not to point you in the direction of this superb recipe by thewoksoflife. Both these soups are best eaten at the hottest temperatures so please head over to our Picnic Flasks article for ideas on how to enjoy these soups at their peak. Barbecue Pork – This delight, also known as Char Sui, is a great dish to have in your basket. It’s as simple as anything you would care to find to prepare and cook. Using ingredients that are easily available, the pork will take around half an hour to cook. Slice the tenderloin up and enjoy to your heart’s content. Use this simple to follow recipe and make sure to invest in some quality ingredients like five spice powder. The barbecue pork from the video below can easily be done on a portable BBQ. 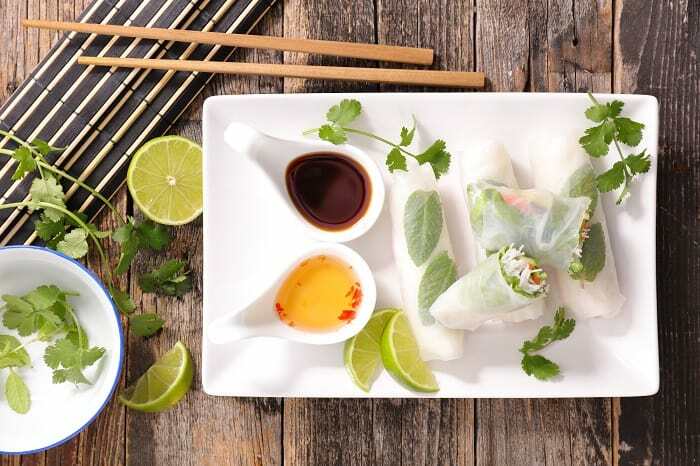 Fresh spring rolls – Technically Vietnamese but we already had that whole discussion about authenticity and things right? Spring rolls are about as Chinese as you can get! But are not the greatest thing if eaten cold in my opinion. If you’re unlucky, you can get a mouthful of congealed fat. This is where the fresh spring roll comes in. It’s pretty much the same as its Chinese cousin except it leaves out the frying process. This means that the roll is raw. This makes for whole new tastes and textures for you to experience. This recipe which includes a dipping sauce is a firm favorite of mine. Crispy Shredded beef – A dish that brings back some of my earliest memories. Mainly trying not to overdose on sweet, sticky sauce. Nowadays I like my shredded beef when it’s not swimming in its own sauce. I prefer the texture of the crunch that you get with less sauce. If you are open to a bit of on-site cooking then this is great to eat fresh from the pan. If not then don’t worry. I’m frightfully addicted to snacking on this dish when there are leftovers and it has turned cold. Check out our article on picnic stoves if you fancy cooking up a storm. Century eggs – I had to throw one of these delicacies in here, I just had to. I will also prefix this suggestion with an admission that I lasted about 5 seconds into my virgin experience with this food before I gave up. The century egg has been preserved for months at a time which turns it a browny green color. The subsequent smell and flavor tones which this produces are what some might call an acquired taste. However, if you’re up for a challenge and you need to get that authenticity into your Chinese picnic then give this a try. Let us know how you got on in the comments section. And enjoy an imaginary doff of the cap from us should you succeed in eating one. Spiced duck salad – You simply cannot go wrong with a picnic salad and this particular one offers a little heat to go with all your goodness by way of five spice. It is an absolute breeze to prepare and gives you the option of introducing a meat rarely seen on a picnic blanket. Egg tart – A big favorite in China, the egg tart is a pastry with a sweet filling. Please be careful though as they are extremely moreish. I have come close on occasion to finishing a whole batch though guilt finally won out and I let others share them with me. 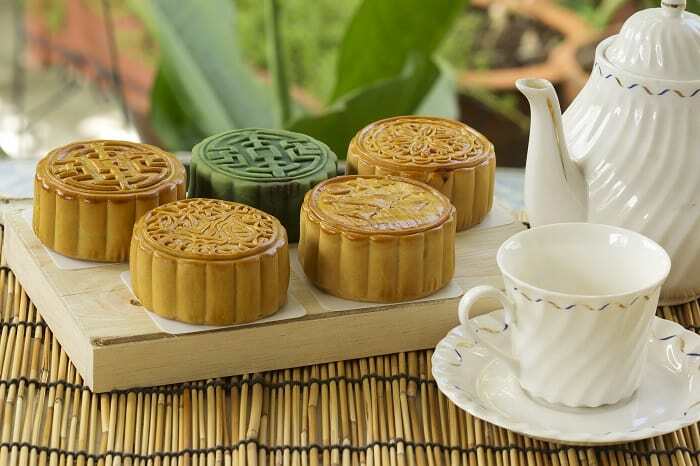 Moon Cake – Traditionally eaten at the mid-autumn festival. It is a pastry made with red bean or lotus seed paste and will more often than not contain an egg yolk which represents the moon. It’s definitely an authentic touch to your picnic if that’s the route you want to go. Lychees – Fresh fruit is often what you will be offered for a Chinese dessert. So why not join in and pick a fruit that is native to the land itself. If you have a Chinese store near you I would definitely recommend buying them fresh although canned lychees can be just as nice if there are none near to you. Chrysanthemum Tea – China loves a cup of tea, probably more than the British. There are whole painstakingly precise ceremonies that are centuries old to attest to this. Chrysanthemum tea is a popular variant which claims a whole host of health benefits, being caffeine free is one such. Baijiu – If it’s liquor that you require then Baijiu is by far Chinas most popular tipple. Described as Chinese vodka, Baijiu is made from differing grains depending whereabouts in the country it was made.